The new And Also The Trees album is titled "Hunter not the Hunted". It will be released for retail and online shops on March 26th 2012. And can be ordered as CD and special double 10 inch gatefold vinyl version (with bonus track) from March 06th onwards here. 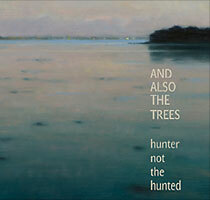 And Also The Trees present ‘Hunter not the Hunted’ as an entire ‘novel’ of an album. The album’s subtle shadowed beauty and intense quality are a result of recent intimate live shows in bizarre spaces, where the proximity of the audience enveloping the band, created a unique and magical feel reflected in this work. Hunter not the Hunted breathes and pulsates with its own pace. Recorded in the heart of England and a dilapidated house in France during an uncharacteristically cold summer, Hunter not the Hunted evokes a kaleidoscope of characters and scenes. 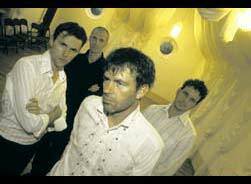 Singer and lyricist Simon Huw Jones creates protagonists rooted in their environment, be it by the sea, deep in the countryside or lost in an edgier urban setting. The words hint of illicit and unsettling journeys mirrored by solitary walks along flooded landscapes drenched in light - his voice conveying emotions that permeate and resonate with each telling; sometimes soaring, sometimes deadpan. Guitarist Justin Jones illustrates his stories with delicate and intricate arrangements, developing his influential and distinctive orchestral-style guitar sound with flair and imagination – the guitar as raconteur - embracing influences from England, through Europe and on to the Mediterranean. Emer Brizzolara on dulcimer provides shimmering accompaniment, with drums, double bass and percussion used to great effect to illustrate the isolation. Demanding full attention from the listener, Hunter not the Hunted promises to take you to a timeless yet oddly familiar place, just beyond memory. » Folks, don't do this to me! Makes my heart ache. "To where?" » What about the bonus track? New song?